This quilt has been a favorite on our couch for a month now (unbound!) and I just keep forgetting to take a picture of it….so this will have to do. 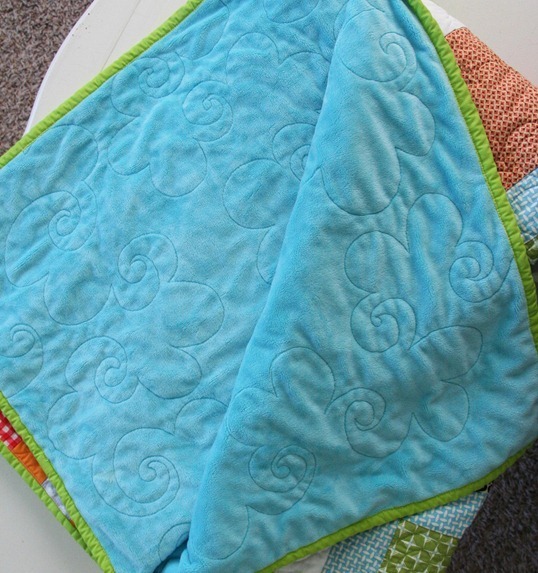 I made this quilt for my boys because my chain reaction quilt was looking pretty worn….and Ben requested a “soft” quilt. So soft it is, with a bright blue minkee on the back (bought locally). I sent this quilt to Christina for quilting. I’m sure she was cursing my name during the process as it took some trial and error to get the set up right….but I sure love the quilting. I used some random fabrics and bright solids for this one. I wanted it to have a playful, summery, boy look without being baby-ish. This was my own PDF pattern that you can find in my pattern shop. Nice quilt! Every couch should have a quilt on it, I think! I absolutely agree! Most chairs, esp. recliners as well!! Oh gosh that quilt is GORGEOUS!! I remember when C was having all sorts of problems w/ her long arm … you were to thank for that!? ;] I'm sure she loves you bunches! Let's talk soon, k? Oh my goodness! That quilting is fabulous!! I will be anxiously awaiting this pattern. I love it!! It's perfect Allison. I love your patterns too. So easy to follow. I'm actually working on your Juice Box pattern right now. Love that pattern on your sons quilt. Sometimes I wonder how one would go about writing a pattern and then getting it in print. I have ideas floating anyway! Those bugs might be a little early for my 3 yr old you think? How beautiful you really are and have been very summery with all those colors so much fun. I also want to have a quilt for the couch, but now I have a small cat that bites you all … the shatter. We do hex bugs too!! That is gorgeous! I would be so terrified of trying to quilt minkee, but you make it seem possible. Bright and colorful, and definitely not babyish! oh I love your quilt, the colours are so vibrant. We love the hex bugs too, funniest little things! Love your quilt! You make such bright, happy quilts! I know right?! Just don't let them on the kitchen floor while they're on. You'll be moving your fridge, oven, and dishwasher in no time. But if it happens, I guess you can get some cleaning done before you move them back after getting the bugs out from under them. No joke, happened to me. And p.s., love that quilt!!! We love the hex bugs too !! Get some of the glow in the dark ones they're super cool!!! I love minke for quilt backs. I made my kids all quilts last Christmas and they turned out so soft. They love dragging them all over the house. I am your newest follower. I love this blog so much, and can't wait to go through all the old posts. Please come visit me at my new blog, Ric Rac and Polka dots. I'm brand new, but have lots of fun stuff planned to share with everyone. Hope to see you there! I've been thinking of trying minkee on the back of a quilt. I wonder if it is slippery and would a grown man be ok with it. Great for kids. I look forward to another pattern of yours I have 4 now. Great quilt, not sure about bugs. 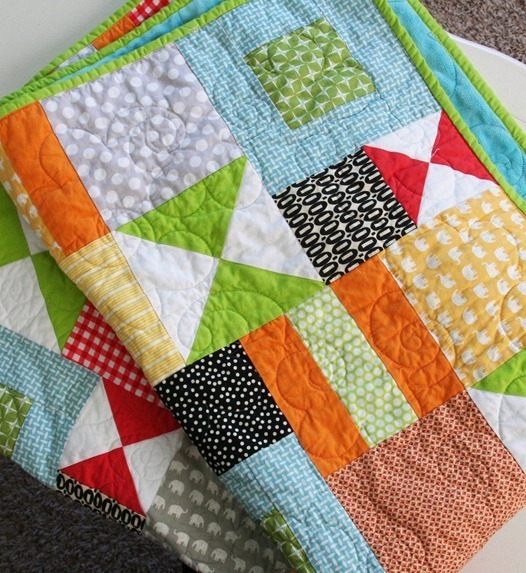 i love the colors and pattern of your quilt! Me encanta como has combinado los colores en ese edredon, has tenido mucho gusto. I LOVE this quilt. I cannot wait for it to come out. It looks like the perfect happy fun boy quilt. I want it in my house :) You create the most beautiful quilts. My Mom just bought two of your patterns and I cannot wait to see what she does with them. Yea! You got the binding on! I wasn't cursing you, but I was cursing the machine and Minky a little. I'm so glad I got it figured out, cause I love the Minky for quilt backing. I might have to try it for myself on day. I really loved this pattern and all of your fabric choices, too. It was a super fun quilt! I'd wondered it the Minky would cause problems with quilting. I use a home machine – looks great and I know it super comfy. I love this quilt (as I love most of your quilts, it's not all that shocking)! 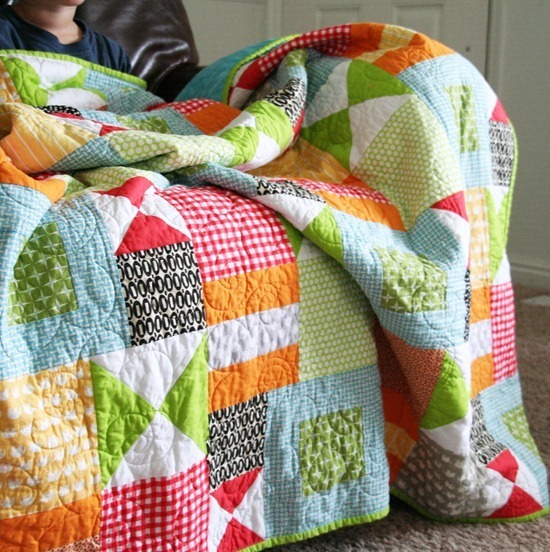 I'm looking for a fun pattern for my 2 year old, but can't see enough of this quilt to re-create it! I would be super-excited if you posted a tutorial or sold a PDF! I love it! The colors are fantastic, the pattern is very visually interesting, and of course Christina's quilting pulls it altogether beautifully. Well done and thanks for sharing! This inspires both my color selections and my longarm quilting! love it! can't wait for the pattern! I am in absolute LOVE with this quilt. Inwas at Gardner village in SLC the other day with my sis-in-law and I was tickled and so proud of you to see your patterns in the quilt shop there. I felt pretty cool knowing you and I told my sis that you taught me everything I know!!! Way to go Al!!! it looks sooooo beautiful. I'm looking forward to the pattern. That's maybe something for my little girl, too. I would love a pattern for this- it is my favorite yet! Can't WAIT for the pattern!! IN LOVE. Can't wait for the pattern. And, gasp, I think I like quilting. Never thought I'd say that!! I love to sew, but I think the quilting bug has bitten hard!! I just finished skipping squares, and I'm itching to start a funky one to keep in the living room!!! I like the quilting. It really looks great on the minkee backing. I ADORE this quilt! I'm wondering if you've written a tutorial for it. Great job. Would love the pattern for this! Yes, please post the pattern soon! This is just the pattern I've been looking for–I've got a bunch of fabric set aside for a quilt for a friend and have been at a loss as to what pattern to use. This would be fantastic!!! I looked in your shop for the pattern and can’t find this one. Have you posted it or have done a tutorial for it? I’m excited to try it.